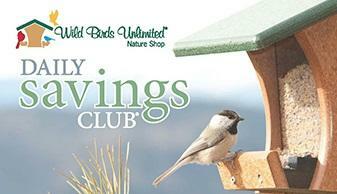 Become a Member Now and Save 15% on Bird Food Everyday! Sale prices aren't good enough for members of our Daily Savings Club®. They receive an additional 5% OFF the sale price of the Best Bird Food in Town. With savings like that, your birds will be begging you for more food. Stop by soon to experience everything Mother Nature has to offer and the best prices on the Best Bird Food in Town.